One of the rarest honeys, apple blossom honey is a fine-tasting monofloral variety with several beneficial properties and therapeutic effects. It’s a spring honey, one of the first to be made, and one honey bees use to feed their offspring with. It is harvested in very little amounts each year, but nonetheless highly appreciated for its aromatic taste built on unique flavor notes as well as therapeutic benefits. Raw, unprocessed apple blossom honey is known to have antibacterial, antioxidant, anti-inflammatory and diuretic properties. Its use is encouraged in cases of respiratory tract infections, digestive upset, even gastritis, acne, eczema and fatigue. What is apple blossom honey more exactly? Apple blossom honey is a monofloral variety of honey made from the flower nectar and, incidentally, pollen of apple blossoms. Technically, apple blossom is a monofloral (unifloral or varietal) honey, meaning most of the nectar that goes into making it comes from apple flowers and only a small percentage from other flowering plant species. For example, pears, plums or cherries flower roughly at the same time as apple trees so it’s not unheard of for apple blossom honey to contain a bit of nectar and pollen from these species too, just not too much. Apple blossom honey polyfloral? If the label of your apple blossom honey says polyfloral, it actually means that it is not really apple blossom honey. For a honey to be labeled monofloral, most of the nectar used to make it has to come from a single flowering species, often that proudly listed on the front of the label, although it may contain small amounts of nectar from other sources as well. So your apple blossom honey should say monofloral, guaranteeing that it contains more nectar from apple flowers than from other plant species flowering around the same time in the same area. However, if it says polyfloral, then it can mean that your honey contains more nectar from sources other than apple flowers. So read the label to find out whether your honey is real apple blossom or not. What does apple blossom honey look like? It is generally a very light-colored honey, more exactly a clear, pale golden or light amber color (meaning a light golden brown). Think the likes of acacia honey. However, depending on how much of other nectar sources it contains (remember that monofloral honeys do not contain a single source of nectar, but a predominant one and smaller amounts of a few others), its color may gravitate towards a darker golden or amber. Also, there are apple tree species that bloom in summer instead of spring (August instead of April to May as most do) and their particular nectar may impart a darker pigment to the honey as well, although the color is mostly influenced by the presence and amount of other types of nectar honey bees may have sourced together with the apple blossom one. What does apple blossom honey taste and smell like? The variety is a delicious, moderately sweet and pleasantly aromatic honey with fine flavor notes and a subtle flowery-fruity perfume. Apple blossom honey has a moderate taste intensity and stands out with its fruity aroma and delicately sweet aftertaste reminiscent of apples. Overall, it leaves the impression of a fine honey of high quality. It has been noticed that the honey has a moderately fast crystallization time. 1) Natural antibacterial action. Apple blossom honey contains a natural antibacterial agent called hydrogen peroxide, but also pollen particles with proven boosting effects on the immune system and has an acidic pH and low moisture content that utterly discourage bacteria growth. All of these elements combined ensure the antibacterial action of the honey by actively reducing bacteria numbers and inhibiting their growth. 2) Good for colds, flu and other respiratory infections. Raw, unprocessed (unpasteurized, unfiltered, unheated) apple blossom honey can be eaten as a natural treatment for respiratory tract infections. Its antimicrobial and anti-inflammatory action not only helps fight the infection, but also manage symptoms and improve recovery time. However, if you are allergic to either apple flower pollen or honey bees, avoid eating the honey or any honey because there is serious risk of allergic shock. 3) Soothes a sore throat and calms cough. The raw, unprocessed honey can be eaten after meals to help calm sore throat irritation and cough. The antibacterial and anti-inflammatory elements it contains act directly on the throat lining, reducing inflammation and discomfort and protecting from further irritation. In order for it to produce its effects, eating and drinking have to be avoided for an hour after taking the honey. Also, if you add it to tea, remember to let the tea cool down to room temperature before mixing in the honey because heat destroy the beneficial elements in it. Just as important, do not give honey to small children without the consent of a doctor. 4) Anti-inflammatory properties. The various elements with anti-inflammatory action in apple blossom honey contribute to its wide range of uses, from helping in the treatment of respiratory tract infections, reducing sore throat discomfort to calming digestive upset and stomach lining inflammation occurring in gastritis. 5) Boasts prebiotic properties and can help calm digestive upset. The natural sugars in apple blossom honey feed the good bacteria in our digestive tract, acting as natural prebiotic and contributing to digestive health. Taken on an empty stomach, the honey is said to help calm digestive upset, including discomfort caused by gastritis, as well as stimulate appetite, but its effects are believed to be mild. 6) Good for gastritis. Eating honey in general on an empty stomach in the morning and postponing eating or drinking anything for at least an hour afterwards is believed to help in the treatment of gastritis (read more about what foods to eat and to avoid for gastritis). Honey is said to form a sort of protective coating over the irritated stomach lining, preventing further inflammation and, in the case of some particular varieties, even encouraging the stomach lining to regenerate itself. 7) Source of vitamins, minerals, antioxidants and other nutrients. Like other honeys, apple blossom too contains small amounts of several essential vitamins and dietary minerals, notably vitamin C, B vitamins, potassium, magnesium, calcium , phosphorus, iron, zinc and others, but also other elements of nutritional value like pollen particles with immune-boosting effects, antioxidants with anti-aging action, unique honey bee enzymes, beeswax particles, propolis etc. The raw, unprocessed, unfiltered, but mostly unheated honey holds the most benefits and any form of processing takes away from its therapeutic action. 8) Great for fatigue and hypoglycemia. Like other honeys, apple blossom too has tonic, energizing effects primarily thanks to its content of natural sugars, but also to its nutritional value. In limited amounts, it can be a very useful tool in fighting fatigue and preventing low blood sugar levels (hypoglycemia) and low energy levels. However, diabetics should consult with their doctor first to know if they can or cannot eat honey. 9) Said to have diuretic and possibly cholesterol-lowering properties. This particular variety has been said to boast mild diuretic effects with a beneficial action of kidney function. There have also been reports of the honey helping reduce high blood cholesterol levels, but neither benefit has been proven scientifically yet. 10) Wonderful skin benefits. Raw, unprocessed apple blossom honey is a wonderful natural remedy for various skin issues. Applied regularly, it can help unclog pores from impurities and clear sebum, taking away the source of food of acne-causing bacteria and thus help reduce acne breakouts and minimize the effects of the condition. Moreover, being a light-colored honey, I find it is great for uneven skin tone and, at the same time, makes skin more radiant and healthy-looking. It has also been suggested that apple blossom honey can help with sensitive skin, dermatitis and eczema and exert anti-aging benefits. Conclusion. 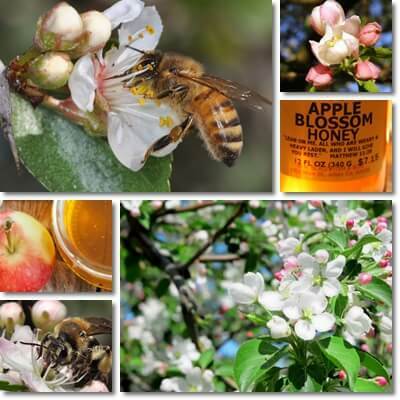 Overall, apple blossom is a varietal honey with a particularly beneficial action on human health. Its therapeutic action spans from preventing hypoglycemia and managing fatigue to calming cough, soothing sore throat or other symptoms of respiratory tract infections. It is apparently good for stomach problems, skin issues and inflammation and benefits the digestive, respiratory and even immune system. However, remember to always choose certified honey from trusted sources, check the label for information and remember that you get the best benefits by eating the honey raw and unheated, provided, of course, you are not allergic to it.